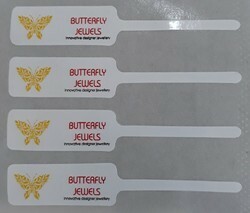 We are a leading Manufacturer of jewellery tag from Nagpur, India. We are one of the major manufacturer and suppliers of wide range of Jewellery Tags. We procure our raw material from most trusted vendors which give crisp & clear printing quality of images, small texts etc.. Our labels are used to print prices, organization's logo, weight and other details related to the ornaments. These labels are appreciated for their features like clear printing, easy attach-ability and non tear-able. We have in-house testing laboratory to match the best label ribbon quality compatibility for all make thermal transfer printers. Designing a jewelry label for price and description display is quick and easy. Our jewelry labels, also known as barbell labels or jewelry stickers, are available in a few different sizes and a variety of materials. We also have options for coloured jewellery tags on demand. Looking for Jwellery Tag ?